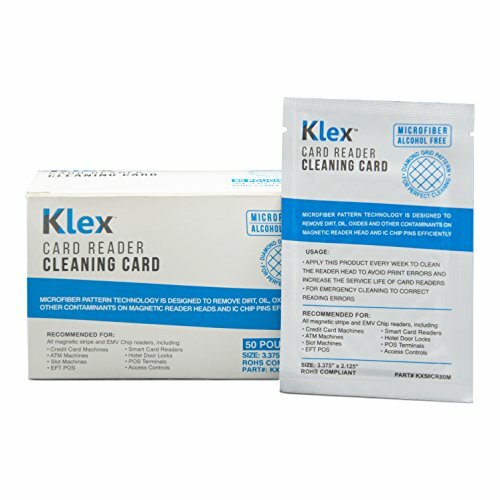 Klex Microfiber Credit Card Magnetic Reader Cleaning Card Alcohol Free 50 cards by KLEX at Home Entertainment Centers Online. MPN: KX50CR80M. Hurry! Limited time offer. Offer valid only while supplies last. Pre-saturated microfiber cleaning cards are designed to effectively remove dirt, oil, and other contaminants on magnetic and optical reader heads. Pre-saturated microfiber cleaning cards are designed to effectively remove dirt, oil, and other contaminants on magnetic and optical reader heads. Use regularly on swipe, insert, and motorized readers to prevent contamination build-up and increase your reader's service life. If you have any questions about this product by KLEX, contact us by completing and submitting the form below. If you are looking for a specif part number, please include it with your message.